The Numbers element can be used to create an animated display of numerical data, counting up from zero to your specified target number. To adjust, simply slide the duration bar to change how long the animation should play in seconds. The slider's maximum amount is 10 seconds, but if you would like for your animation to play for a longer amount of time, you can manually enter in your desired amount of seconds in the box provided. The numbers can be separated into thousands using a comma. By default there is a dollar ($) sign in front of the number (to count up, for example an amount of money raised), however you can remove this sign by deleting it on the Prefix box. If you would like to show a decimal value, simply adjust the decimal slider. To change the font, color, and size of the number, select the style settings icon. 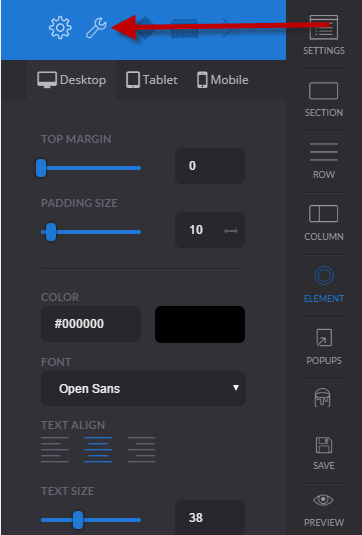 From there you will be able to select the features you want from a list of fonts, and change the color, size, and other settings.